As soon as you enter the room you feel at home. Warm colors and materials, wood and glas, everything matches. Spacious bathrooms with a walk-in shower and partially a separate toilet. The hotel offers 5 single rooms, 5 double rooms, 2 family rooms with a pull-out sofa bed and one gallery room with two separate single beds. Baby beds are available upon request. One double room is a fully equipped disabled room. 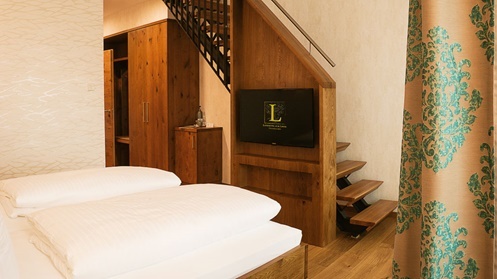 All rooms feature a safe, flatscreen TV, telephone, complimentary WiFi, hairdryer and a terrace or balcony. All our rooms are nonsmoking rooms. Kindly note that dogs are not allowed in our premises. Baby beds are provided upon request. A rich breakfast buffet is served on a daily basis. Our single rooms are quipped with a 140 cm wide bed, bathroom with a walk-in shower and hairdryer, flatscreen TV, complimentary WiFi, desk with internet access, balcony or terrace, telephone and a safe. 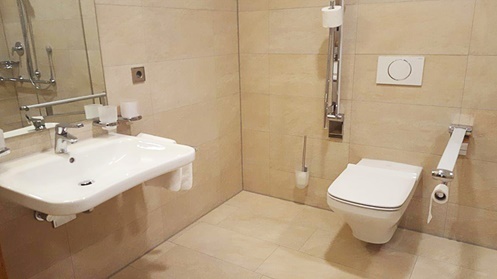 Our double rooms are equipped with a bathroom with a walk-in shower and separate toilet (only exception is the room for disabled), hairdryer, flatscreen TV, complimentary WiFi, desk with internet access, balcony or terrace, telephone and a safe. One double room is a fully equipped disabled room. Our gallery room features a separate children’s room with two beds, bathroom with a walk-in shower, hairdryer, flatscreen TV, complimentary WiFi, desk with internet access, balcony, telephone and a safe. Our family room are equipped with a pull-out sofa bed for two children, bathroom with a walk-in shower and separate toilet, hairdryer, flatscreen TV, complimentary WiFi, desk with internet access, balcony, telephone and a safe. Extra-wide 90s entrance doors, bathroom incl. WC with wide sliding door, wheelchair-accessible washbasin and shower with handrails and hair dryer. The room has a flat screen TV, free Wi-Fi, desk with internet access, terrace, telephone and a safe. 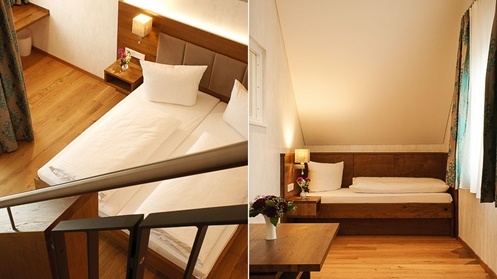 100,- EURO per night including breakfast for 2 people.